Kansas GOP Insider (wannabe): We're Number 5! 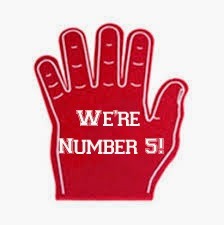 We're Number 5!! State officials are touting their latest achievement today. We're number 5.... in highway performance and efficiency. Honestly, I am a little embarrassed when we cheerlead these sorts of accomplishments. In the 21st Annual Highway Report, Kansas ranked number one in the category of rural interstate pavement condition, third in urban interstate congestion and fifth in rural arterial pavement condition. So, the people at the Kansas Department of Transportation are doing their jobs? If anything, we should probably be offended that we aren't number one in urban interstate congestion -- we kind of have an advantage with our limited number of urban areas. As much funding as KDOT receives every single year and as often as our roads are covered in orange barrels, we ought to be near the top of the list. And let's be honest, KDOT funding is kind of a slush fund. We spend buckets of money improving rural roads that see three vehicles per year just to keep the peace with western Kansas. I'd be happier if we were in the top five in efficiency in schools or public safety, or something Kansans genuinely care about. Being tops at highways seems like applauding the table scraps. As an aside, somehow, the Wichita Eagle, Liberal Wichita Rag, managed to turn this story into a snide quip about Brownback. The rag writers aren't impressed that we're number five. They're discouraged that we aren't number two. Whatever.